Even though it was created over a decade ago, this slot still sounds promising because of the developers who stand behind it. Microgaming has always been know for developing some of the best online betting machines in the industry. Let’s see if this one will live up to their name! When it comes to the quality of graphics and imagery, the visuals are a bit pale but they’re not too bad. There are no modern animations or similar features but the graphics are pretty good for such an old-school machine. We will get into the more interesting details as soon as we cover the betting rules and regulations below. Those who want to play Thunderstruck for real money must keep in mind that this video machine offers quite a low betting range. You can bet anywhere from 0.01 to 45 coins, which means that high rollers won’t be very happy with this game. However, if you like to keep things safe, you can give the reels a spin for as little as 0.01 coins. It is important to mention that you might get bored quickly if you continue betting at the lower end of the scale. Bets below 20 to 25 coins won’t bring you many awards. Therefore, if you want to keep things interesting for a while, make sure to place larger bets to get that adrenaline pumping! What most players want to know when reading about a casino online betting machine is how they can win some money while spinning the reels. In this case, the Thunderstruck casino slot online offers two special features – the free spins round and the rewarding wilds. For starters, the wild symbol of the game is Thor and it can replace all other symbols on the reels except for the Rams. Whenever Thor shows up during your spin and replaces one of the icons on the reels, all your winnings for that round will be doubled. Even though it is quite old-school, this machine still features the ordinary structure with wilds and scatters. Therefore, the scatter is represented by Rams. 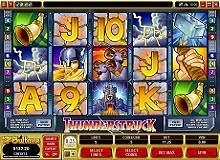 Landing three or more scatter icons will reward the player with 15 Thunderstruck free spins. What’s great about this feature is that it can be activated over and over again if you keep landing three or more scatters in a row. However, that’s not everything the scatter can do for you. Each time you score a win thanks to a scatter card in the combination on the reels, all your winnings will be multiplied by the initial bet you placed at stake. This feature can result in enormous payouts if you keep your bets closer to the higher end of the betting range. Unfortunately, that’s about it when it comes to the features of the Thunderstruck game. 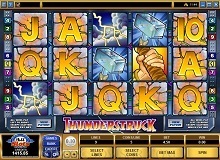 As you can see, the Thunderstruck slot offers a very limited amount of features. However, it still has more to offer than some of the modern casino games out there. For a 15-year-old game, the slot is quite profitable. Its RTP equals 96%, which is not bad at all. If you are a fan of old-school, vintage games, you should definitely give this one a spin, especially if you like the theme it is based on. Even though there are many newer games based on the same exact legend of Thor, this Microgaming release has that special, traditional atmosphere that you can only find in older games. When it comes to the graphics, everything is kept on a very simple level. There are no animations or sound effects, which is something that modern players have become used to. However, you can still enjoy the traditional style of spinning the reels and the basic features such as the free spins and rewarding wilds and scatters. 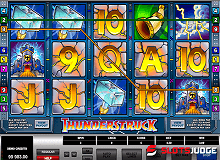 Overall, the Thunderstruck casino slot online is a great choice for beginners and players who like to keep their bets low. However, if you’re looking for big payouts, we recommend you to look elsewhere because those who play Thunderstruck casino slot online have very limited possibilities of scoring large amounts of money. Copyright © 2019 funfreeslots.co.uk. All Rights Reserved.